After you’ve seen Samarkand’s beautiful UNESCO-listed heritage sites, learn all about high-quality Uzbekistani wine. 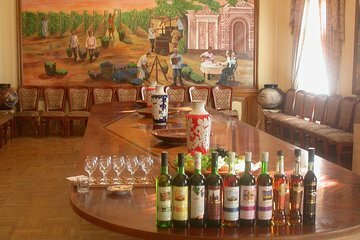 Enjoy a two-hour tasting tour of the Khovrenko Winery, where you’ll get to try local wines and cognacs. Tour the Samarkand Museum of Winemaking with your local guide. Travelers who appreciate fine drinks will especially enjoy this tour. This was a great little side excursion to those who like and appreciate wine. You will try 7 different kids of wine, 2 cognacs, and 1 digestif the best of them all, I think. It was something I really enjoyed. Some of the grapes used in the Khorovenko vineyards and Georgian grapes, others come from cuttings of old French grapes while others were Uzbek grapes. But they were all very tasty. Highly recommended as a side trip after seeing the Registan.